I was asked by a friend to paint a view of his marsh. 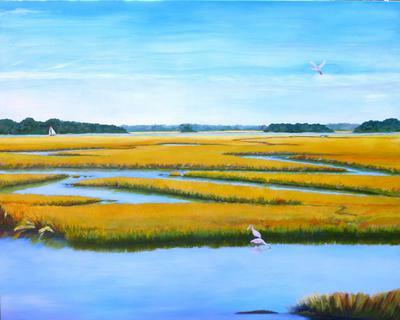 He had just moved into his million dollar home and wanted the painting to be 4' x 5' (no pressure there - and I had never seen his marsh the way he wanted it as describe below). He provided me a photo to work from. 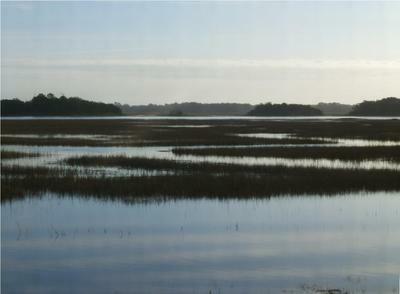 He wanted a golden marsh at high tide, a sailboat in the distance and a few spoonbills. They are usually quite pink but he hates the color pink. I was so lucky to come across this website and look at the many tips. I had started using Atelier Interactive paints about 2 years ago but had never used any medium. Most of my paintings were small. I quickly found out when I started this very large painting that I couldn't get a large brush stroke all the way across the canvas before it started to tack up. I had the clear painting medium, the unlocking formula and the fine mist sprayer. It definitely was a learning curve. I'm attaching the photo and the finished painting. The painting is not as bright as the photo shows. Atelier paints too but I am still on a learning curve. The sky reflected in the water is good. Has a brightness to it that would be realistic I'd imagine. One of the comments talked about wading through the water........do alligators live in that marsh? I can only endorse the other comments. Terrific job. Your comments are very encouraging. My husband and I delivered the painting to them last night and they loved it. I have to admit it did look very nice in their home. Nice dynamic between the yellow and blue and a great sense of distance too. Must have been a really interesting challenge working on such a size particularly when you normally work on much smaller pieces! ... hopefully you friend will commission lots more pictures! I would love to see this in real life. It is beautiful and I just want to go for a wade through those marshes. Thanks so much for submitting your painting - I think you've done a great job within the very specific parameters your friend has set for you! Ahhhh friends....gotta love 'em!